It’s fall and winter is right around the corner, and that means it’s soup season. But what types of soups can you fix your child with ADHD? What types of guidelines should you use to make homemade soups? First of all, you have to remember that if you’re ever in a bind with a schedule that is far too busy to even allow you to breathe, you can always go to the old standby of canned soup. However, not all canned options are good soups for ADHD, so choose wisely. For example, a soup high in sodium – more than 350mg of sodium per serving – is an absolute no-no. Check the label and be sure to consider how many servings your child will eat. You also want to stay away from any soups that have a long list of chemicals, additives and preservatives in them. It’s possible that your ADHD child will react to some of these chemicals, causing his or her symptoms to get worse. When you buy canned soup, don’t assume it is nutritionally adequate as it is. To get the most out of the meal you’ll have to add more protein and vegetables to the soup. It’s easy to throw in some spinach, which will provide your son or daughter with plenty of B vitamins as well as minerals. You may also want to add a tablespoon of soy lecithin granules, which will dissolve into the soup. Anyone will benefit from this supplement but you might notice your child has more clarity of thought when he or she eats soup with this added. Lecithin is technically called phosphatidylcholine, and it’s especially important for the brain to make neurotransmitters. Aside from its nutritional benefits, eating soup can also result in a smaller intake of calories at meal times. Researchers at the Department of Nutritional Sciences at the Pennsylvania State University found that study participants who started a meal with soup consumed 20% less calories than those who didn’t. 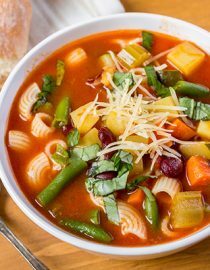 If you’re concerned about your child’s weight, soup is a great option, and it also helps you sneak more vegetables into their ADHD diet. Aim to make a big pot of soup and have it in the refrigerator for easy rewarming after school. It’s one of the best snacks you can have waiting for your child. Correlations between ADHD and eating disorders have been difficult for clinicians to define. Recent studies suggest higher-than-normal eating disorder rates in people with ADHD.